Rocannon’s World was Ursula K. Le Guin’s first published novel. It contains some of the forms of a fantasy story but takes place in a science fictional setting, part of the Hainish universe that she developed in several of her later novels, including The Left Hand of Darkness, The Word for World is Forest, and The Dispossessed. The Hainish universe is not one of those tightly constructed future histories in which plots unwind across many volumes and vast swathes of time. Indeed, some of the novels contradict each other on key points, and there are inconsistencies among many of them. This didn’t bother Le Guin, and it needn’t bother a reader particularly. She was working things out while she grew as a writer, and I’m glad that she didn’t feel the need to retcon a bunch of things, or bend later novels out of their natural shapes to fit notions laid down in earlier ones. One constant through the stories is that humanity was dispersed among a great many worlds a long time ago and has continued to evolve along what become parallel paths on all of the different worlds. Eventually different human worlds attain interstellar travel, and a loose collection of worlds is knit into something resembling a polity. The early books call that polity the League of All Worlds; later ones, the Ekumen. In many of the stories, interstellar travel is still slower than light, but in Rocannon’s World, inanimate objects can travel faster than light, while living beings cannot; superluminal communication exists, but the devices capable of transmitting between the stars are vanishingly rare (the two fleets that appear in the book have only one each). They echo with the anthropology that Le Guin grew up around, distancing both narrator and reader from the actions she describes, but allowing them to partake simultaneously of science and myth, reporting and religion. How can you tell the legend from the fact on these worlds that lie so many years away?—planets without names, called by their people simply The World, planets without history, where the past is the matter of myth, and a returning explorer finds his [for they are all male; Le Guin would not write female protagonists until years later] own doings of a few years back have become the gestures of a god. Unreason darkens that gap of time bridged by our lightspeed ships, and in the darkness uncertainty and disproportion grow like weeds. This is lusher Le Guin than her later work, but it sets the stage for the scientific romance that follows. 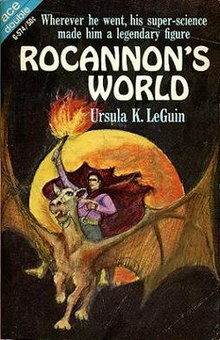 Rocannon is a representative of the League of All Worlds, returning to a world orbiting Fomalhaut II that earlier expeditions said harbored at least three highly intelligent life forms. The League, unfortunately for Rocannon, is in the midst of civil war, and the rebels have set themselves up on this world. They blow up the fleet he arrived with, killing everyone else in the expedition. After Star Wars, it feels more difficult to cast the rebels as the bad guys. Searching for the rebel base with the goal of destroying it does not sound like a proper task for a novel’s hero, but in 1966 none of that cultural weight had to be lifted, and that is indeed Rocannon’s self-set task. He finds allies among the most human-like of the three known intelligent life forms, a people with roughly feudal technology and society. These people, the Angyar, remember previous visits from the Starlords and grant Rocannon great status on that basis. They do not have the technology to help him, but they can guide him to another people who live underground and who have mastered more knowledge, maybe even including interstellar tech left by previous visitors. The book is an extended journey, a hunt, a quest, and like any good quest narrative, in the end the protagonist’s character matters more than the external trappings. Over the course of the story, Rocannon loses more and more of what he has brought with him, and has to become attuned to the new world to succeed. What he loses and what he gains are the heart of the story, with the resolution of the plotline about the rebels feeling almost beside the point by the end. In less than 120 pages, Le Guin packs in cultures, species, myth and mysticism. Fifty years past publication, it’s not full of surprises, but it is full of engrossing situations, living characters, and a few crystalline moments that raise it above a plain story of fights, flights and rockets. Just three years later, she would turn science fiction on its ear with The Left Hand of Darkness.